The Yarlung Tsangpo Grand Canyon in the Tibet Autonomous Region of China is the world's deepest. Yarlung Zangbo Grand Canyon, Tibet. Where Is The Yarlung Tsangpo Grand Canyon? The Yarlung Tsangpo Grand Canyon is the world’s deepest and longest canyon. The canyon, also known as the Brahmaputra Canyon or the Tsangpo Gorge, exists in Tibet, China. The canyon is slightly longer than the Grand Canyon with a length of 504.6 km. The river that flows through the Canyon, the Yarlung Tsangpo, originates near Mount Kailash and after draining a section of the Himalayas, it enters the gorge near the Pei village in Tibet. The village is thus considered to be at the entrance to the Yarlung Tsangpo Grand Canyon. The Canyon extends for a distance of 240 km and bends around the 7,782 meters tall Mount Namcha Barwa and then cuts through the eastern Himalayan range. The river flowing through the gorge then drops from 2,900 meters near Pei to 1,500 meters at the Upper Gorge’s end. Here, the Po Tsangpo river joins the Yarlung Tsangpo. 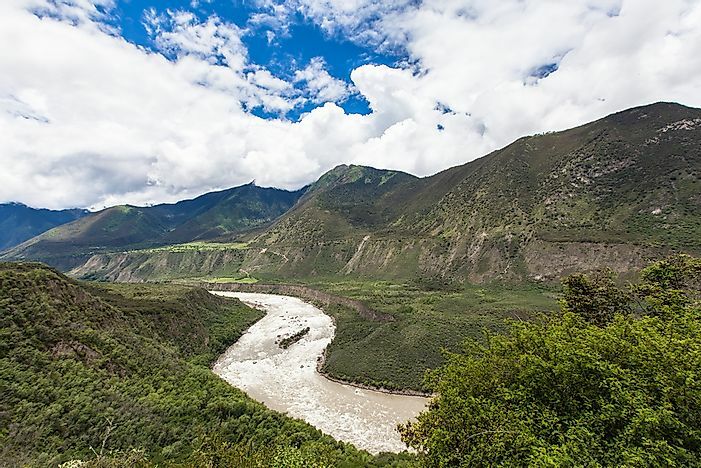 The river then continues through the lower section of the Yarlung Tsangpo Grand Canyon to cross the border into India at an average elevation of 660 meters. From here, the river flows through Arunachal Pradesh to finally become the Brahmaputra River. How Deep Is The Yarlung Tsangpo Grand Canyon? The canyon has an average overall depth of about 7,440 feet. The average depth of the canyon between the Gyala Peri and Namcha Barwa mountain peaks is 16,000 feet. The canyon’s maximum depth is 19,714 feet, the deepest in the world for any canyon. The canyon has a rare collection of flora and fauna in a state nearly untouched by human influence. It is one of the last remaining places on Earth that has not been exploited by humans. The climate of the regions ranges from the Arctic to the subtropical type. Temperature varies greatly from the origin to the end of the canyon. The highest temperature is about freezing in the upper reaches to as high as 43.6 °C in the lower reaches of the canyon. The takin, a goat-antelope endemic to the Eastern Himalayan region, is found here. There is a possibility of the construction of a major dam on the Yarlung Tsangpo River as it flows through the Yarlung Tsangpo Grand Canyon. If this is to happen, the dam would exceed the scale of the Three Gorges Dam as it would generate an anticipated 40,000 megawatts electricity, double the output of the Three Gorges Dam. However, the construction of this dam would have an extremely negative impact on the environment. It would spoil one of the last remaining pristine habitats, displace thousands of locals, and also cause great losses to millions living in India in the lower course of the river as little water would now reach them.